People Analytics: Because HR is a numbers game, too! We live in a talent economy and now more than ever, companies are realizing that with great people comes great business success. With the rise of 'Great Place to Work' contests and the popularity of LinkedIn, HR departments have gained significant strategic importance over the past few decades. Companies have recognized that when they have a well-balanced and happy employee base, this reflects in every other part of the business. One of the ways in which we can use our HR data is to predict who is going to leave the company when. By comparing your 'loyal' base to the ones that have left your organization deliberately in the past (using predictive modeling techniques), you can spot the main differences between the two and see at which point in their careers people tend to leave and what the probable causes could be. Or you could monitor external data like job popularity or vacancy information. Doing so, you might be able to pick up on the fact that someone's position is becoming increasingly popular. This then is your cue to make sure those people are and stay happy before your competitor comes in and swoops them away. For example, I know of a pharmaceutical company that is already identifying "high-flight-risk" candidates among their high-potential employees by collecting data from LinkedIn and other social media networks. You could even build a social network of your employees by looking at e-mail frequency, for instance, to detect crucial nodes in your employee network. When crucial nodes resign, people that are 'close' to them in a social network have a very high probability of leaving too. 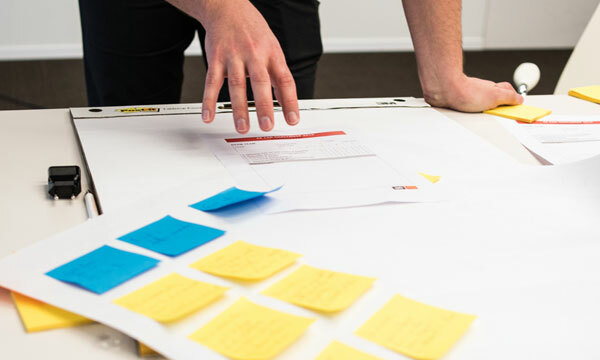 An added benefit is that you can tailor the questions suited to your business. A high-tech company developed an analytics model that predicted whether employees were likely to become "toxic" (liars or cheaters) and reduced this population amongst hires significantly by adding and analyzing special parts in the interviewing process. 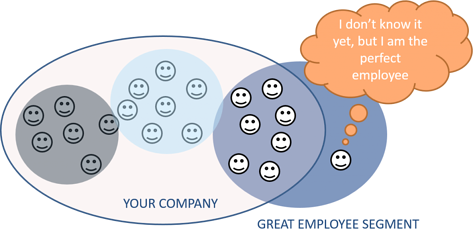 Using the data you collected from people already inside and still outside your company, measured right up to the hiring date, you could conduct a segmentation analysis and identify your 'great employee' segment: people that are not yet in your company but are in said segment are perfect candidates to pursue. For example, you might find that people often take a 'sick' day on Mondays. If you dig deeper, you might find these people are usually single mothers and the Mondays on which they are not at work tend to be Mondays after a holiday period. This might indicate that these specific people are just having a hard time getting their 'ducks in a row' on a particularly busy Monday morning. Solutions for this problem might be to allow them to come in two hours later on these days but have them work half an hour later for the rest of the week. Another application of this could be directed medical controls. Medical controls can be a big cost for companies when checking up on employees who stay home sick. If there was a way to estimate someone's probability of not actually being sick, these controls could be better informed and directed. Instead of choosing people to visit at random, directed medical controls can ensure that you visit the 'riskiest' employees first. A lot of companies already sit on top of an enormous amount of HR information that is full of potentially valuable insights. Think about legacy HR and planning applications or off the shelf HRM products like PeopleSoft. 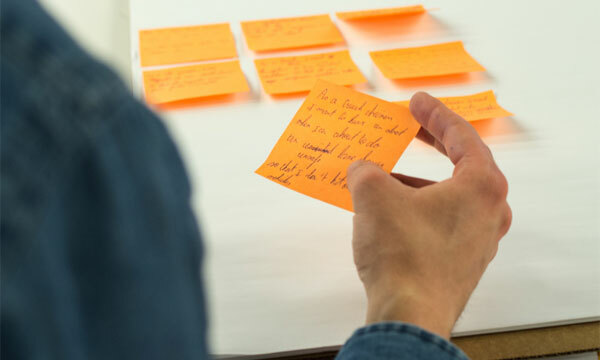 Other possible sources of information could be badging hours, user logins from home, email traffic, external data, data collected during interviews, performance review data, background check data ... Your company may already be doing analytics in some form or way and you could leverage this expertise and these tools. People analytics is gaining momentum. HR departments across the globe are realizing that data is the answer to solving questions about why people join, stay or leave a company. As stated in Deloitte's Human Capital Trend report, Belgium still needs some convincing compared to the rest of the world, but undoubtedly will soon catch on as well. Percentage of respondents rating People Analytics as an 'important' or 'very important' trend. 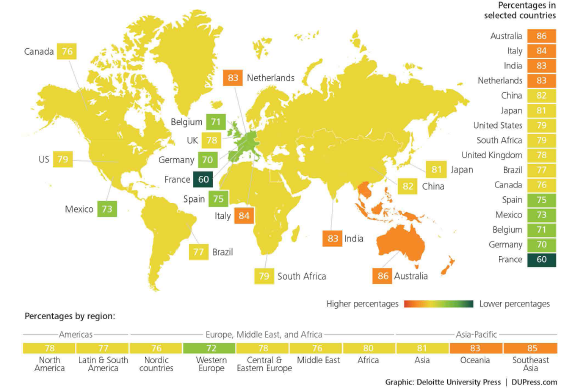 Global appreciation for people analytics per Deloitte's Human Capital Trend report. 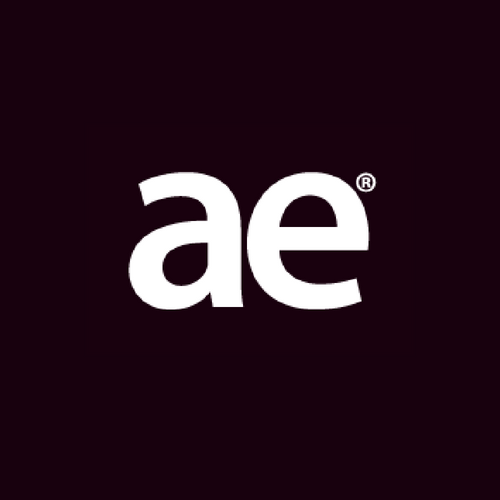 If you would like to talk to an experienced partner or need someone to help you get started, reach out at info@ae.be.